There is also the 'openmoko' GTA04 coming along. with nice advantage of being fairly open hardware wise. Is the nokia N9 a good target for people interested in free phone software? how easy is it to put new distros on it. 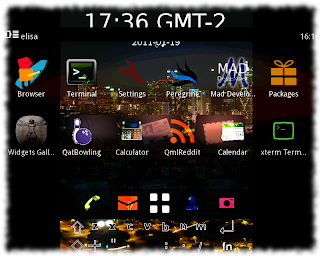 Anonymous: Yes, I'm quite aware of GTA04 :) Waiting to upgrade one of my Neos to it. Let's wait for the Nokia N9 to ship first, approximately 3 weeks from now according to latest news. Then we'll find out pretty soon, but like I said the current best information is that the default software can be replaced without too big hurdles, although voiding warranty. Since it's OMAP3 hardware, it should be pretty good start all in all for free software distributions. Nokia N950 (the "N9 dev kit"), which has the same hardware, is already out there in developers' hands and I saw on IRC that someone had made a call with MeeGo CE already, ie. oFono et cetera. So everything looks good for N9 as well, especially since the modem driver apparently is similar enough to the N900 isi driver ie. both oFono and FSO can support N9. Hi Timo, http://tabletroms.com is a community working on developing alternative distributions for Tablet computers, and its greatest successes have been in supporting the Adam Android tablet manufactured by Notion Ink and the Advent Vega. I once owned an Openmoko Neo and was really grateful for the Openmoko.org community's support, which made the original product more usable. Unfortunately, I had to return my phone as it didn't suit my daily and intense usage requirements. I am now trying to solicit interest from open source software developers, especially kernel developers, who might want to participate in the ongoing efforts.